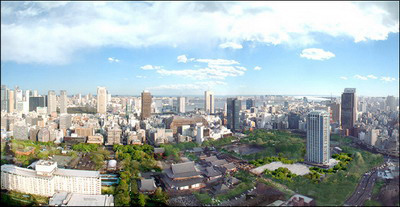 Tokyo's rise to importance can be largely attributed to two men: Tokugawa Ieyasu and Emperor Meiji. In 1603, after unifying the warring states of Japan, Shogun Tokugawa Ieyasu made Edo (now Tokyo) his base. As a result, the city developed rapidly and grew to become one of the largest cities in the world with a population topping one million by the 18th century. It became the de facto capital of Japan even while the emperor lived in Kyoto, the imperial capital. Shinjuku is one of the 23 special wards of Tokyo, Japan. It is a major commercial and administrative centre, housing the busiest train station in the world (Shinjuku Station), and the Tokyo Metropolitan Government Building, the administration center for the Tokyo Metropolis. The area around Shinjuku Station is home to a large concentration of department stores, specialist electronic and camera shops, cinemas, restaurants and bars. Many international hotels have a large presence here. A long-time center of shopping, fashion and entertainment, especially for the younger set. Shibuya is also home to some of Tokyo's largest and newest nightclubs.